The Grisha Trilogy introduced readers to the irresistible fantasy world of the Grisha - and now Leigh Bardugo brings us a new sweeping epic. Ketterdam: a bustling hub of international trade where anything can be had for the right price - and no one knows that better than criminal prodigy, Kaz Brekker. Kaz is offered a chance at a deadly heist that could make him rich beyond his wildest dreams. But he can't pull it off alone. Six dangerous outcasts. One impossible heist. Kaz's crew is the only thing that might stand between the world and destruction - if they don't kill each other first. Below, you will find: (a) a three-part review that's about six paragraphs too long, (b) in which I reveal no spoilers, but (c) in which I make you incredibly hungry. I'd offer apologies, except I'm too busy re-reading Six of Crows right now and all the calls go directly to my voicemail. In lieu of an apology, I offer pictures. Proceed with hunger. And feast your crows eyes on this incredible, incredible beauty. Fun fact about me: I hate the universe, umbrellas and compasses. No, wait, that's not right. I love the universe, umbrellas and compases (though admittedly I haven't had much use for the latter). But I do hate to give into universal, all-encompassing umbrella recommendations of EVERYONE IN THE WORLD NEEDS TO READ THIS. I don't believe such a book exists. And when it does, know that one of the utopian/dystopian realities we've been dreading is upon us. 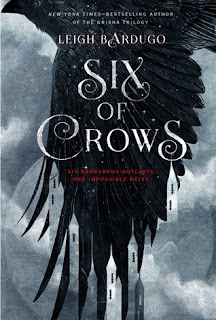 Having said all this, Six of Crows is as close to a ubiquitous recommendation I will ever give. All the umbrellas! So it is my sincerest recommendation to STOP, DROP AND ROLL! Stop (what you're doing), drop (everything) and roll (to the nearest bookstore to pick it up)! This is all presuming, of course, that you love good fantasy. I AM A CREATURE OF CAVEATS! If you favor crappy fantasy, move on. No Six of Crows and Nutella cake for you, because you don't like fun! Why Nutella cake? I'm glad you asked! (It does, in fact, exist, and we should all rejoice!) 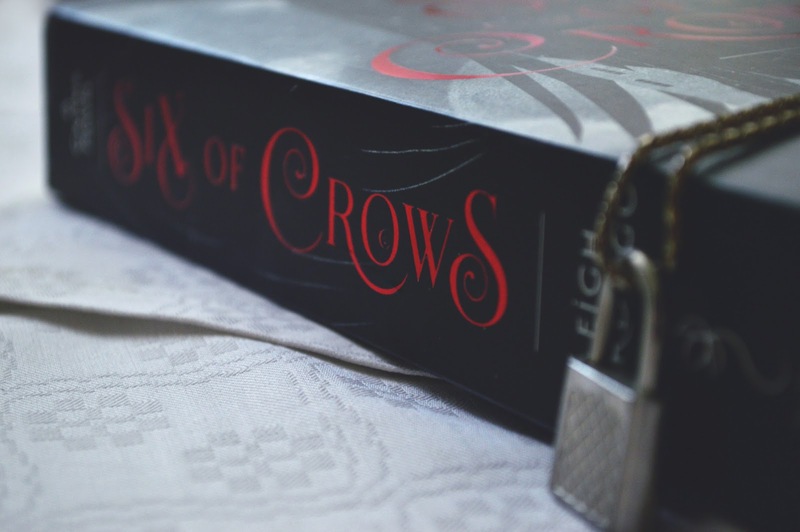 I read Six of Crows on my birthday. By which I don't mean that this book's release happily coincided with the date of my birth. What I mean is I sneaked off to read this book during my birthday party! I FOREWENT NUTELLA CAKE FOR THIS BOOK! If that isn't a show of true devotion, I don't know what is. Kaz Brekker > Nutella cake. And I don't make these statements lightly. I take my chocolate very seriously! If you enjoyed the Grisha trilogy, you will love this book. If you hated the Grisha trilogy, you might still love this book. If you haven't read the Grisha trilogy... read it. And then read this book. Umbrella recommendation. I wasn't kidding. 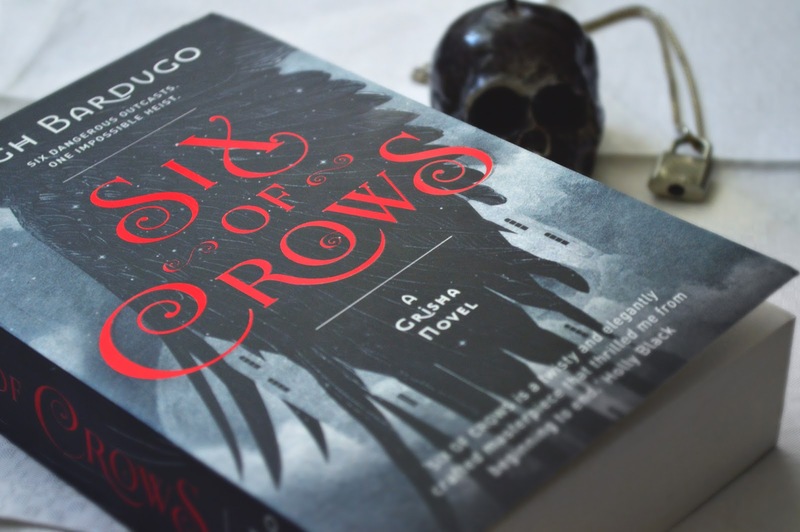 As far as the plot goes, Six of Crows is a heist novel set in the fantasy version of The Netherlands. And then Scandinavia. And also Russia. If you need a second to take in all the potential for michief, mayhem and debauchery this offers... take that second on the way to the bookstore. In Amsterdam Ketterdam, a band of anti-hero outcasts with dubious moral compasses band together to attempt to break into an impenetrable fortress in fantasy Scandinavia. For reasons which shall become known to you after you've arrived to the bookstore. But all of which can be summed up with treasure, glory, power, (dis)honor. It goes a long way in depicting the kind of book you're in for when the first showdown in the first chapter between two rival gangs on neutral territory doesn't become a matter of outgunning one's opponent. It all comes down to outwitting them. "You may have the bigger guns," in short, "but I have already modified them so they shoot backwards. Go ahead. Call my bluff." And in case this introduction to a world of cross and double-cross isn't enough to make it clear what you're in for, then the writing will drive it home beautifully. Locks aren't broken/jammed, they are finessed open. These criminals are smooth, elegant masterminds and darn if they won't show it at every turn! These smooth, elegant criminal masterminds are also absolute squad goals! In the event of a zombie apocalypse, forget Rick Grimes. It's these six you want having your back! (As long as you've already emptied your pockets and you aren't looking particularly edible. I did heavily stress the anti-hero thing.) In fantasy-Amsterdam, where pleasure districts and casinos outnumber the humans who will see the morning sober, you come to expect questionable morals. But then Kaz Brekker, gang leader and the smoothest criminal of all takes the job at the center of this plot not to save the world (which needs it), but for glory and riches, and a chance for a slow destruction of his enemies. And while in the past month, many have wondered why this book is just everything one could ever ask for in a book, ever, I have deigned to put my caffeine-addled mind to work and bring forth an answer. An answer has thus been brought forth! Behold! But I'd much rather they didn't. This plot and these characters. They are everything. P.S. Past a certain point the chapter titles are COUNTING DOWN HOW MUCH TIME IS LEFT. Holy pacing! P.P.S. Clean out your OTP list. You're going to need extra room on there. *cough* For reasons. P.P.P.S. Are you at the bookstore yet? If you have made it this far, kind human, (a) I thank you, and (b) I shall assume that you are still here because you have already purchased Six of Crows are can therefore ignore to afford my attempts to rush you to the bookstore. Excellent. We are of one mind. Once we get the Crows on board, we can proceed to take over the world and make this book Required Literature. But in the meantime, please leave a comment and let me know how you enjoyed Six of Crows and what your favorite parts were. I routinely fangirl about it on social media, too. Not to mention my Tumblr. 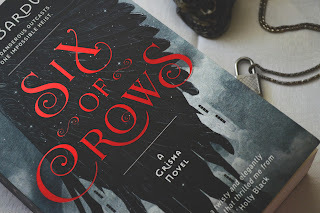 * Also, while there were no spoilers in this review, I wish to give special thanks to my friend Dennis, who routinely spoils me with books, and who bought me Six of Crows for my birthday before the true obsessing even started. You know my soul, Dennis! And you're the best kind of a spoiler! We're two girls with a love for the written word. 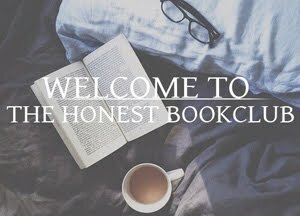 Our humble blog is where we can unload all of our bookish thoughts and fangril with fellow readers like yourselves!. Like what you see? Add your email to subscribe. Glad you liked it! SoC is one of my favourite books of 2015!! Same here, Felicia! It's DEFINITELY going to reign supreme in my end-of-the-year favorite book recap here on the blog. It's going to sit atop he pile and laugh at the lowly books below it, because it's the King of Everything. This is honestly such a great review! You said exactly what I was thinking when I was reading it. I didn't read the grisha series but now I must! If you're willing, you absolutely MUST! Some of Inej's blades are named after some of the characters from the Grisha trilogy! IF THAT ISN'T ENOUGH INCENTIVE...! Thank you very, very much for your kind comment, dear! It's supposed to be the netherlands?! MIND=BLOWN. I guessed, like. Russia. I don't know. But it's just so unique and gorgeous! The entire original Grisha trilogy takes place in Ravka, which IS a fantasy equivalent of Russia. But then Six of Crows starts out in Ketterdam, which I figured was... Rotterdam? Amsterdam? Some Dutch -dam, at any rate. ;) And then the Fjerdan portion of the book is clearly Scandinavia - Norway or Sweden, most likely. Even Matthias's looks support that assumption. I'm thoroughly in love with Leigh Bardugo's mind, really. Thoroughly in love. Hello from Natalie and Lexie! This is where book obsession, book reviews and general bookaholic tendencies converge in a tiny, blog-sized package. News, reviews, lists, discussions and more are available weekly, primarily in the field of Middle Grade, Young Adult and New Adult literature..